Cardiff is a charming seaside village with a long surfing history, about 20 miles north of San Diego, between Solana Beach and Encinitas, with terrific views of the Pacific and San Elijo Lagoon. 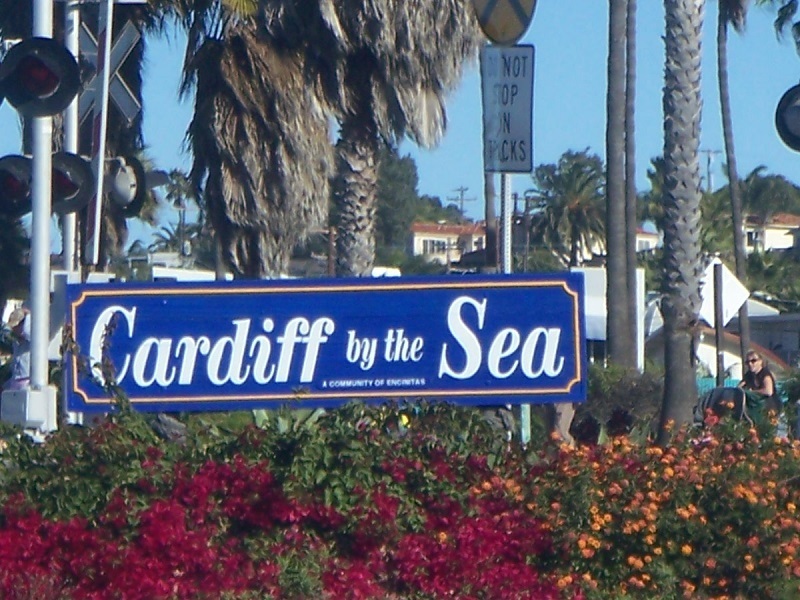 Cardiff (Cardiff-by-the-Sea) is a community of approximately 4550 housing units, both owner occupied and rentals, in an area of about 1.9 square miles. While Cardiff has its own zip code (92007) it is officially part of the Encinitas Town Government. There are 2 main neighborhoods, the Composer District (north of Birmingham) and the Walking District (south of Birmingham and east from downtown). The Mercantile Building in downtown Cardiff was originally a hotel, but has also been a grocery store and library. Patagonia, an upscale retail store, currently occupies the ground floor. The original pier, just north of today's Restaurant Row on the Coast Highway, was destroyed in a storm in 1916 and never rebuilt. Cardiff has a long history as a popular surfing destination, and there are a number of vendors and plenty of surfing-related entertainment - one recent event attracted 20,000 visitors. Cardiff offers a range of housing, but at a hefty price tag, at least near the coast, especially those homes with ocean views. Limited inventory, beautiful views, and overall desirability combine to keep home prices in Cardiff high. You will find a variety of housing styles, as well as apartments and condominiums, and several gated communities. Upside-down homes (reverse floor plan) are common on the hill to take advantages of views, and many are 3 stories on narrow lots. Be aware there are building height restrictions to prevent owners from adding on too much space above existing levels and blocking views of neighbors. While Cardiff is not known as a fine dining community, there are some very respectable places to eat, especially while looking at the ocean. Restaurant Row on the Coast Highway has a number of restaurants that are directly on the ocean. Pipes is one of the best known breakfast places around, and Trattoria Positano on San Elijo just before the main intersection in town is quite good and popular with locals. Yogi's, a sports bar and pub, is another popular eatery that attracts residents and visitors, although I have heard mixed reviews. The beaches, of course, are spectacular, and offer great surfing, sunbathing, kite flying or just enjoying the views. You will often find stone sculptures created by seasoned sculptors and beginners, which disappear over time, only to re-emerge. Parking along the 101 is free and fairly easy to find in the off-season, but summers find parking, as expected, more difficult. Children attend 1 of 2 elementary schools depending on their grade - they both have great reputations from what residents have told me, and from reviews on the Internet. Older students attend San Dieguito Union High School District. There are several private schools in Cardiff as well, including Montessori and the Sanderling Waldorf School. There is some nice outdoor space in Cardiff as well. In addition to the beaches, you can enjoy the community park in downtown, running along the train tracks, and George Berkich Park in the Composer District. San Elijo Park and campground (San Elijo State Beach, between Cardiff and Encinitas) also offers nice space, a great beach, and a popular camping destination. Glen Park, on Orinda Drive, offers a nice play area for young kids, and horseshoes, basketball, tennis and beach volleyball. Neighboring Encinitas offers many other things to do, including lots of shopping, more than 20 restaurants, the San Diego Botanic Garden, and The Self-Realization Temple. Head south to neighboring Solana Beach to enjoy more varied and upscale shopping, especially in the ﻿Cedros Design District, or take in a live music show at the Belly Up Tavern.